Published by Accent Press in paperback at £9.99. ISBN 9781905170814. Available from all good bookshops, Amazon.com and Amazon.co.uk. 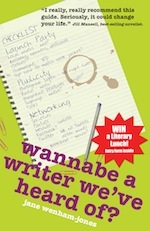 The entertaining follow-up to the successful Wannabe A Writer?, is an essential read for established authors, the newly-published or anyone chasing the limelight. In today’s celebrity-driven world, self-confessed media tart Jane Wenham-Jones, takes us on an uproarious ride along the publicity trail from getting the perfect promotional photo to choosing clothes to wear on TV. Published October 2010 by Accent Press in paperback ISBN 978-1906373979. Available from all good bookshops, Amazon.com and Amazon.co.uk. Daily Mail’s review of Wannabe a Writer We’ve Heard Of? Prime Time and Wannabe a Writer We’ve Heard Of? photograph courtesy of Madalyn Morgan Treaddell. 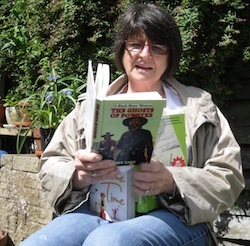 Do you have a photograph of yourself or a friend reading one of Jane’s books? Feel free to email Morgen with your pictures (ideally jpgs) together with your / their website link if you / they have one.